Provide your plants with a breath of fresh air with Aerostar. Its independent pots and 100% ABS aero plates supply include an anti-UV barrier and anti-light, preventing the development of algae. The tank contains 15 to 110L of nutrient solution, as well as ease of access with a detachable hatch. A graduated inlet enables you to quickly view the remaining water level and add more when needed. These systems come equipped with an extra pump, irrigation ramp, and tubing kit including drippers and a 360° sprayers. Oxygen-filled nutrient solution can now be distributed throughout the root chamber. THE FUTURE HAS ARRIVED EARLIER THAN EXPECTED - The Platinium Pots have a unique system which allows for a rapid growth of your favorite plants and completely safe for environment: it is made of 90% recyclable plastic. PROVIDE YOUR PLANTS WITH A BREATH OF FRESH AIR - Its independent pots and 100% ABS aero plates supply include an anti-UV barrier and anti-light, preventing the development of algae. The tank contains 15 to 110L of nutrient solution, as well as ease of access with a detachable hatch. SPACE SAVERS - The Platinium systems have a compact design that saves space and offers user friendly features, including universal bases, interchangeable accessories, easy fill reservoirs with removable lids. EASY SETUP - The Platinium systems come equipped with a pump as well as tubing and 360 sprayers needed for a fast and easy complete setup. 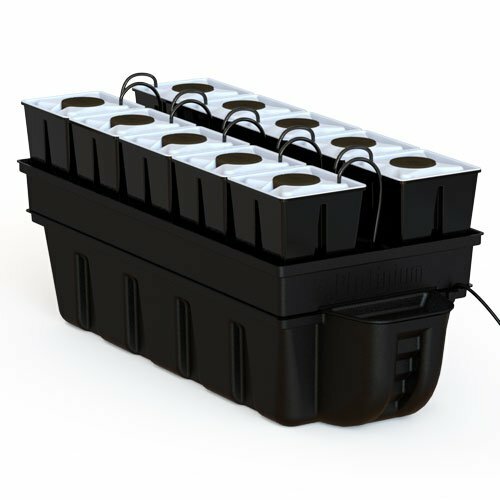 THE MOST COMPLETE ALL-IN-ONE AEROPONIC GROWING SYSTEM - These systems include a reservoir, tray, pots, aero plates, neoprene inserts, 360 sprayers, tubing kit, pump, and easy access reservoir lid. If you have any questions about this product by Platinium, contact us by completing and submitting the form below. If you are looking for a specif part number, please include it with your message.